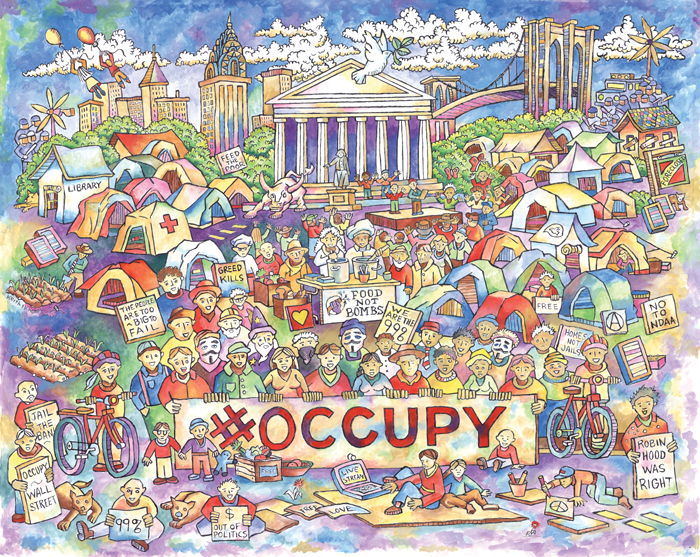 This page provides information on how to provide meals at your local occupation, suggests the formation of affinity groups and suggests strategies on how and why we should re-occupy public space. Reject the Democratic Party's effort to silence our movement. 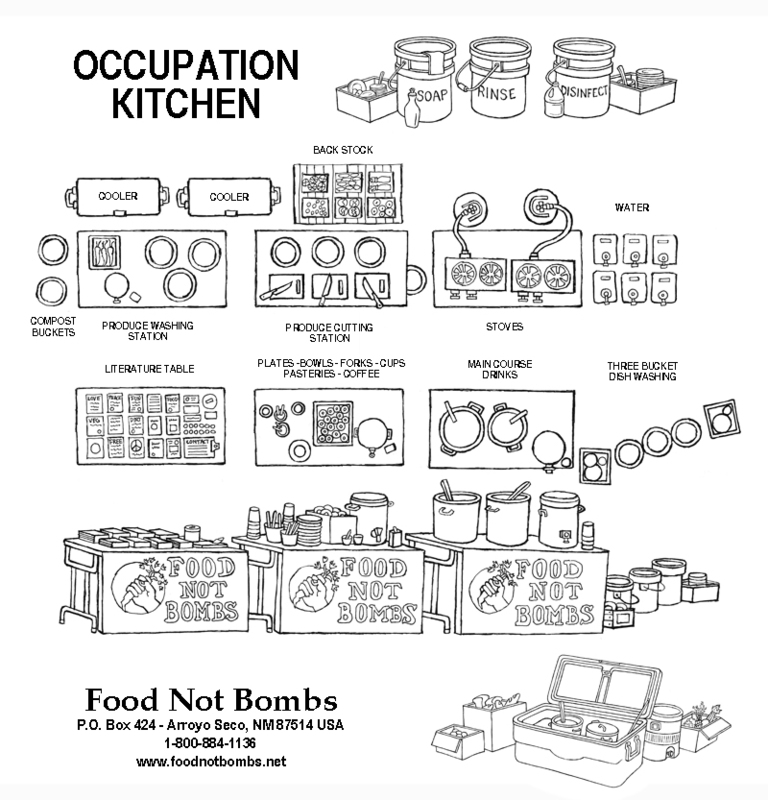 Food Not Bombs has provided food and logistical support of occupations for nearly 30 years. It has proven to be one of the most powerful forms of nonviolent direct action. The authorities know this and make every effort to reduce their impact. The economic and political crisis will continue so we have all winter to organize for next May Day. The government encouraged the use of violence to stop the May 2012 attempt to re-occupy public space. The FBI spent the winter building a bombing plot in Cleveland encouraging some of those cooking at Occupy Cleveland to bomb a bridge in the Cuyahoga Valley National Park. The Partnership for Civil Justice Fund posted internal FBI and Homeland Security memosabout the government's work with corporate security to stop the occupations. We can over come many of the strategies outlined in the internal memos. One way may be the formation of affinity groups to reduce the chaos at general assemblies. Another is the adoption of a nonviolence code as we did before the 1999 blockades in Seattle. We also organized trainings and preparations in communities all across the United States. This made it possible for thousands of us to work in coordination using a process we had all agreed to and practiced during the year before the protest. We organized the UnFree Trade Tour in 1997 to educate the public about the dangers of the World Trade Organization suggest this strategy of nonviolent blockade. 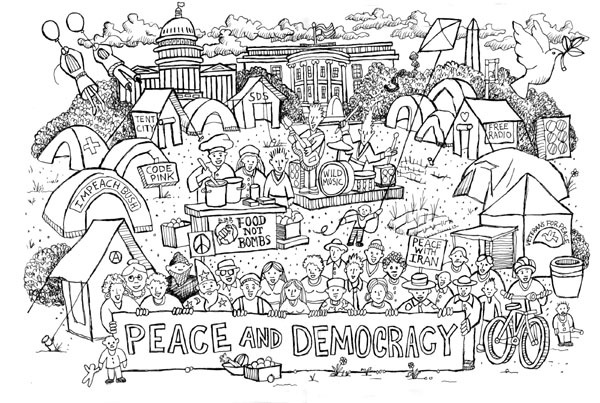 Food Not Bombs also formed Indymeda in 1995 and shared the idea during a number of tours including the UnFree Trade Tour. Having Indymedia Centers all across the world made it possible to share news of the Seattle Protest breaking corporate media silence. Please read these articles to learn more. Many Food Not Bombs volunteers could start preparing for the next re-occupation of public space. Organizing local meetings to form affinity groups and holding Nonviolent Direct Action Preparations. It has been suggested that we arrive to the proposed site with card board images of our tents with slogans painted as banners on our two dimentional tents. At the same time we would be a legal rally that looks like an occupation. As part of this strategy we could announce a boycott of the presidental election if our occupation is evicted. Is the grass and pavement really more important to protect then the lives of those evected from their forclosed homes. Grass or democracy and our future, really what is more important? Food Not Bombs has participated in many marches, rallies and other actions short in duration. Occupying public space is one of the most effective nonviolent direct actions we have participated with. This year we can make our occupations an example of the future we know is possible. We can form affinity groups to provide better corrodination and internal support. Visit our page on affinity group to learn more. We can also start with the principle of occupation as theater until we have reclaimed public space. Food Not Bombs has provided food and logistical support for many occupations over the years. Developig a strategy to re-occupy public space could be the most important action so far. The current uprising is the most impressive to date. We hope you will join us in helping provide food to your local occupation. We have a list of items needed to feed an occupation of 500 people for each week. We also have information below on how to participate in the General Assemblies, form an affinity group and other aspects of the occupations. Please call us at 1-800-884-1136 for more information. Our knowledge of the details required to safely provide meals for long term occupations started in the summer of 1989 even though we had delivered meals to Reagan Ranch in 1983. That occupation is featured in the video ACROSS FROM CITY HALL which you can view here on our website. We also provided meals at the Reagan Ranch Occupation on the Boston Commons, cooked and shared food for 100 days during the Orange Revolution in the Ukraine, a two month Peace Camp on the West Bank in Palestine, Camp Casey outside the summer home of George Bush in Crawford, Texas and a 600 day occupation for farm workers rights in Bosnia and Herzegovina Square in Sarajevo. We also called for several occupations in the United States which failed to have much impact. You can visit the website we made for the 2008 occupation outside the White House here. This includes the diagram on how to organize your kitchen to help provide food for the spring occupations. The easy way to provide breakfast is to prepare a large pot of oatmeal, seek peanut butter, jam and margarine to spread on the day old bagels and bread that you can collect from local bakeries. Coffee and tea is also important. Tired activist that have spent the night on the ground really love a warm cup of coffee. We have used large coffee urns that if lucky we can plug into power or we have even boiled the water on a propane stove and poured it through the urn. We would suggest organizing a station to prepare the food setting up a couple of folding tables with one knife, cutting board and bucket to hold the cut produce. One volunteer can be washing the produce to prepare for cutting. Often the first vegetables to cut can be onions and garlic that you can lightly cooking in oil. A second cook can be cutting the other hard vegetables like potatoes, carrots and turnips. A third cook can be cutting up the softer vegetables like chard and mustard greens. Once the onions and garlic are clear add the hard vegetables and stir for a few minutes and then add water. After 30 minutes or so add the soft vegetables. To make it easy to provide so many meals have pasta, rice and/or beans cooking in a huge pot. For pasta tomatoes or tomato sauce is great to add to the vegetable stew. Add some salt, pepper and other spices to the stew as it is cooking. When it is ready your servers can place the pasta, rice and or beans on each plate and add the stew on top. As you gain practice and recover new ingredient you can start to be even more creative so those participating in the occupation don't get board with the food. To get more information on how to prepare meals for your occupation please review our book Hungry For Peace. It is very important to make sure everyone is well at your occupation. We suggest you have people serve the food instead of letting everyone help themselves. The servers should wash their hands with soap and warm water. It is best to share the food as soon as it is prepared. To keep your pots of food warm we suggest you place the pots in a large ice chest and make sure the lid is closed when you are not serving the food. Bacteria multiply most rapidly between 40°F (4°C) and 140°F (60°C), a range known as the Food Temperature Danger Zone and after three hours in this zone, bacteria may start to become a safety issue so if you keep your prepared pots of food in a huge cooler or ice chest it will stay hot for three hours even in the coldest winter. We also suggest you use a three bucket method of cleaning the dishes and plastic ware. This way you will always have enough bowls, plates and plastic ware to provide measl to everyone that participates. The first bucket contains warm soapy water that should be replaced often. A second bucket of clear water to rinse off the soupy water followed by a bucket of clear water with bleach, vinegar, or hydrogen peroxide to kill the germs. This is a suggested list of items each kitchen can buy or collect to provide healthy food for each occupation to provide over 500 people meals for a week. Please call us at 575-770-3377 for additional support. It would be very helpful if churches or community centers would donate a kitchen. We could also use the donation of mobile kitchen trucks. This list was created after a week of helping organize the food at Occupy DC. You might request funding at the general assembly to buy some of these items. Much of the food can be collected by speaking with local produce distribution centers, groceries, bakeries and other food suppliers. There may be cash and carry or restaurant supply warehouses that can provide large amounts of spices, 60 quart pots and other supplies. Every city has a produce distribution center where tons of produce is discarded every morning after the trucks leave to supply local groceries and other food establishments. Visit these centers around 8:00 AM. Buy some cases of produce and at the same time ask if they have any thing that they are planning to discard. They will be happy to contribute when the learn you are providing food for your occupation. Ask produce workers at groceries if they will be discarding anything and they will also be happy to contribute their waste before it goes to the dumpster. Feel free to use this as a basic outline for the occupation in your community. During past occupations activists have adopted a set of basic guidelines that include no drugs and alcohol, no violence or guns and respect for all to make it possible for the community to ask disruptive people to leave the occupation. This helped prevent the authorities from creating a pretext to shut down the protest. Thanks! As you may know one core principle of Food Not Bombs is that we have no leaders and make decisions by consensus, a process we have practiced for over 30 years. It is wonderful that the Occupations have adopted this process and even more interesting is the fact that our process as gain interest of the media. Feel free to print out copies of our flow chart and provide them to everyone at your occupation. Visit our old website calling for an occupation outside the White House. We have had some calls and heard about a conflict on NPR about homeless people eating at the Occupations.There seems to be an attempt by the government to pit the occupations against the already homeless. One reason we are participating in the occupations is to change our world so no one becomes homeless. In most occupations the homeless have been very welcomed by the protesters and invited to eat as the issue of our people being homeless while the 1 percent can 't even count their homes is pretty central to the reason we are sharing the outside with those already living outside. It would be great if we made some effort to remind the occupations that it would be strange to keep the hungry away from the food. You can even make an automatic monthly donation. Thanks so much for your contribution! (If you would like to donate more than $1 please feel free to add any amount you want to the Paypal form.) If you are interested in making a larger donation of more then $100 or more and request a tax deduction for your contribution please contact us at 575-770-3377. You can also make a monthly donation below. AUTOMATIC MONTHLY DONATION FROM YOUR BANK - An effective way to support Food Not Bombs each month. Imagine a global movement that needs less then $2,000 a month to cover our basic expenses. Your regular monthly donation can help. Thanks so much.